This year, as always, we’ve had some really interesting new people join the Club: Sound professionals working in all kinds of different aspects of audio, from film to music to video games to sound art. I’ve been thinking recently that it’d be good to introduce some of the Club’s members on the website (especially those from places further afield than the U.S and Europe) rather than just see each others’ names tagged on the end of sound files in the collection! 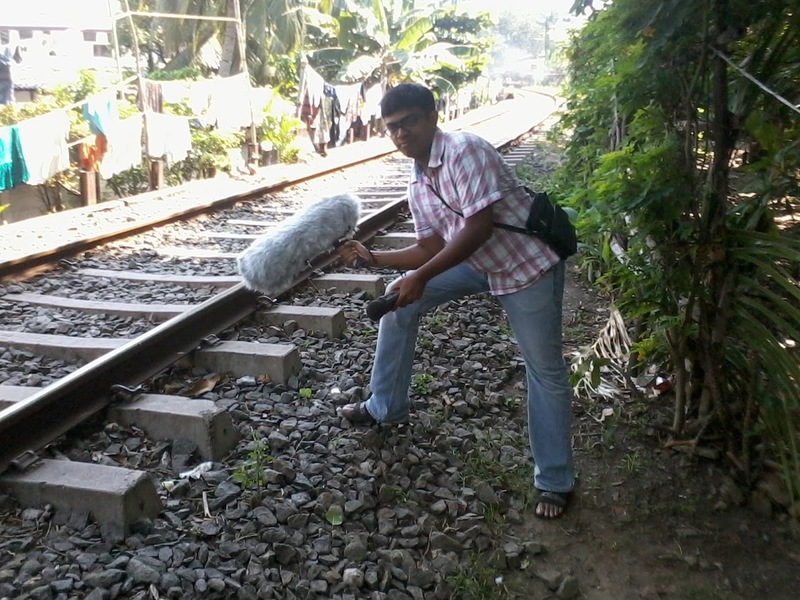 I am a sound designer/sound editor/sound recordist based out of AM Studios, Chennai and I have worked in more than a hundred projects performing various roles in the film audio industry. My experience ranges from Bollywood to BBC. I have also worked with various other European films as sound FX editor/ foley supervisor. I studied the Master of Science degree in advanced music production from the University of Glamorgan in South Wales. I was always passionate about sound in films. I started to take it further at a very young age. 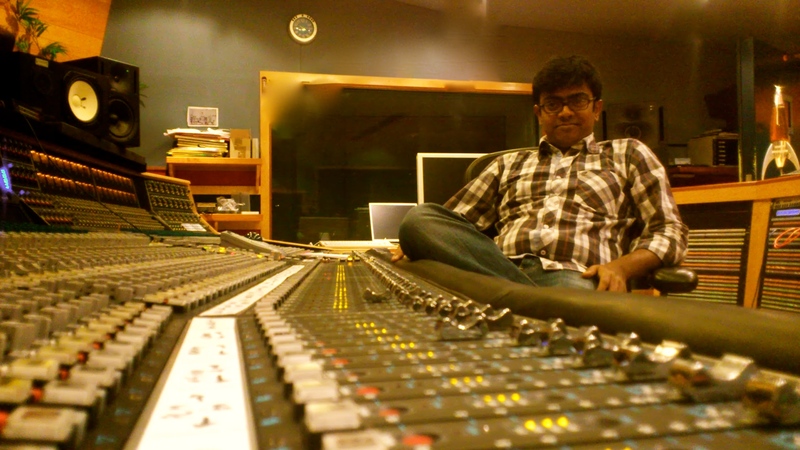 I apprenticed at a famous Chennai based studio, Vijaya Vauhini, when I was 18, then I ended up as an FX editor in the same studio after I finished my Bachelor’s degree (B.Sc Physics at Loyola College – Chennai). In 2005 I wanted to take this further which is when I pursued my higher education at Glamorgan University. After that, I was employed by an animation company called Inspire GLG in Worcestershire as a sound designer. I worked in the Midlands area for a few companies until 2010. In 2010 I decided to move back to India (which is where my roots are) and I started my own company, The-AudioVille, and now I work with a very good group of very talented people. I have a great foley team, and FX editing team who are equally passionate at what they do and they all contribute immensely to the films I work on (one of The AudioVille’s editing rooms pictured below). I have done a lot of Indian feature films of varying genres. Indian films are not just limited to Bollywood. There are nearly 25 different film industries here. Each state has it’s own film industry. For example, the previous film I worked on was released in 2000 screens just in the state of Tamil Nadu which is where I live. Recently – in the past 2 years – I have started doing a lot of European feature films. From my imdb page you can see what I have done….I normally get the footage (i.e. get access to turnovers) online and my current preferred way of collaboration is with Gobbler mainly because it is very fast for uploads and downloads. The collaborators deliver me a Pro-Res or a DNX HD picture and the AAF. I have a very fast 100Mbps upload and download leased line dedicated to collaborative work, so sending and receiving files is never a problem for me. I also normally get notes from the supervising sound editors or directors with timecoded notes on what exactly is required (normally as region groups in a Pro Tools session or sometimes as text files). Then I edit FX following these notes whilst at the same time using my creativity as well, plus recording anything if required. I also have a crew here to work with. They help me out with cutting backgrounds or FX depending on the film’s requirement. 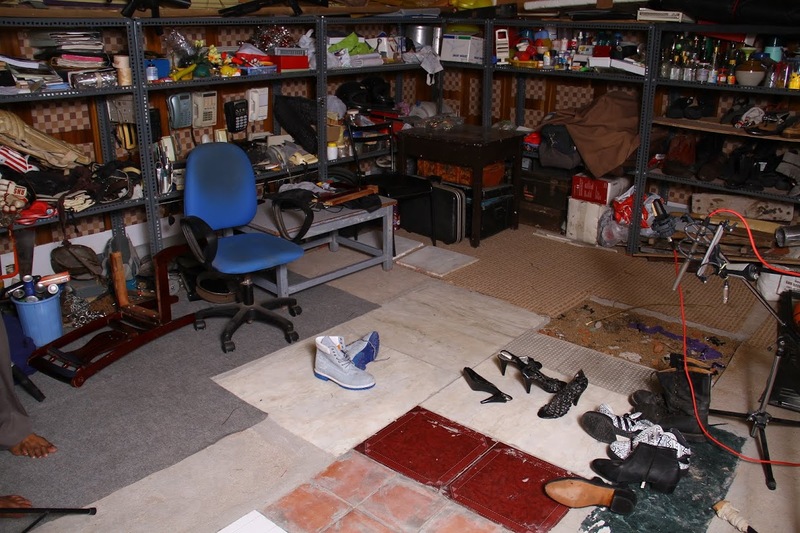 I also simultaneously record foley in our foley room (see below). We have a very clean signal chain there so the recording is as transparent as possible; no noise or anything like that. I also have an extensive library; both commercial (with multi user licences) and my own recordings. We also have a few recorders like Deva, Roland, Edirol, Zoom H6, Nomad etc….and we use them from time to time when required, and some good microphones as well!!! If required I also hire AM Studios (see picture below) which is a step away from my place. 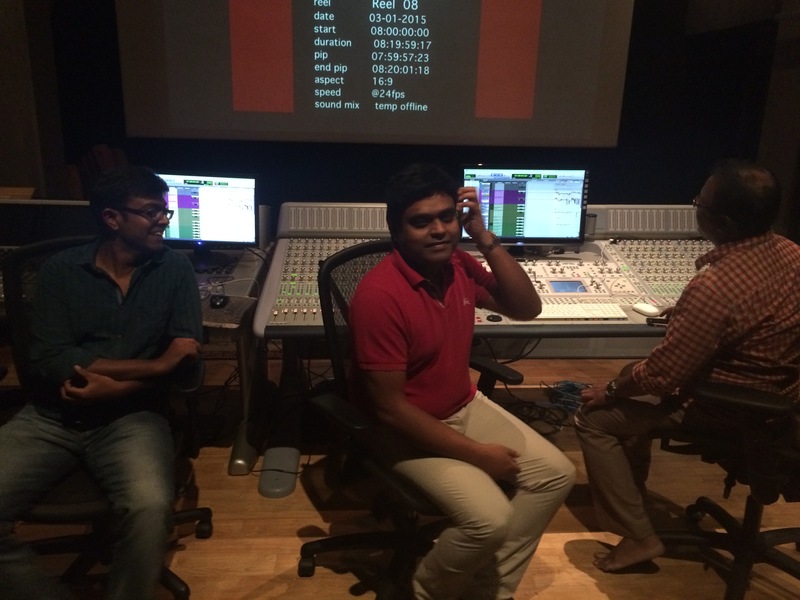 AM Studios is one of the premier Indian post production houses (It’s like the Delane Lea of Chennai!). It is owned by the academy award winning composer, Mr. A.R. Rahman (the Slum Dog Millionaire-famed music composer). The people at AM Studios are a fantastic talent and a fun bunch of people to work with. They have great gear which I can use whenever required. 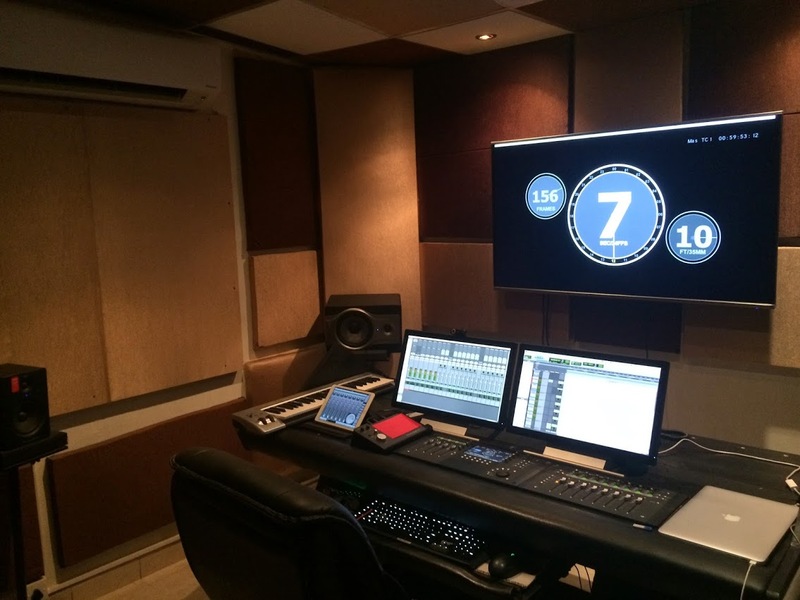 They have a great sounding film mix room with crazy Auro 3D Meyer sound speaker system, with an Icon and a System 5 Euphonix. They have just ordered a large scale Neve DFC with immersive sound panner to replace the system 5 console….which I believe will get installed next month!!! They also have multiple Kyma systems, Great outboard gear like Aphex, Manley, Chandler…etc..etc…..All this can be used as and when required. I am closely associated with AM Studios. All my Indian projects get mixed there and also they give me some good films from time to time. So coming back to the point……when we are done with a reel, I upload a 5.1 bounce or send the actual session for review depending on the requirement. Normally it’s all panned, volume automated, reverbs done and “Mix Ready” all in the box. Working in the box makes collaboration much easier; if I use any outboard stuff I print them onto a separate track. The client then sends back some notes or corrections if required and we do those and send the master session. When I deliver, normally the entire film with all FX, Ambience and Foley are in one large session so it becomes very easy for the client. We are very much prepared to do lots of back and forth kind of collaboration….it seems to be the way to go these days as expectation from the directors are pretty high. We have 3 sound editing rooms, and 1 foley room here. We also do dialogue editing as well. So the collaboration varies depending on the requirement. Also I have recently started sending some of my work to other collaborators overseas as well. The average Tamil industry films don’t spend much on sound and the budgets are shrinking but some of the bigger films have decent budgets. I am always open to collaborating with other sound designers and FX editors around the world. I strongly believe that collaborative workflow is the future as it opens a whole lot of creative possibilities and the internet has made that possible now. I see a lot of talented people in Korea, Japan, UK, US…everywhere…through Facebook, Linkedin and other networking sites. I think India is a market to be explored – especially the big films. With immersive sound becoming very popular here, the demand for quality talent on an economical budget (doesn’t mean cheap) becomes in demand. Gone are those days where a client will walk in to a studio based on the look and feel of the studio and the kind of coffee and canteen you have. These days the film makers are like, “Do you have the talent? Can you do the job in an economical way? Will you spend the budget efficiently? Will you deliver good sounding tracks? You are on!!”. At least, these are the types of film makers that I am targeting. They also end up respecting us for what we do for their films. I think it is the same even in the UK and everywhere. Sometimes the budgets may not be right for one person but perhaps it might be good for the other. So it really comes down to passion and commitment. This entry was posted on July 7, 2015 by sonicskepsi. It was filed under Introducing and was tagged with bio, biography, cloud, collaboration, India, Introducing, Introduction, workflow. Great read! I can’t wait to read more articles like this about other SCC members.